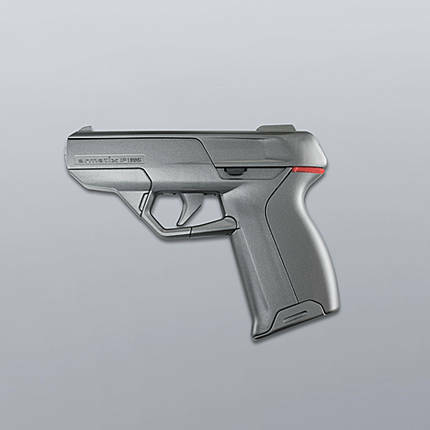 The Smart Gun: Will New Technology Open Up A New Wave Of Liability Claims Over “Dumb” Guns? There is an interesting development in gun technology this week with the announcement of the release of the first so-called “smart gun” to hit the market. The Smart System iP1, a .22-caliber pistol made by the German gun-maker Armatix GmbH, can only function with an accompanying wristwatch. As explained below, this gun and similar new models in the works could have an impact on torts liability for gun manufacturers. The Smart System iP1 is activated by a RFID-equipped watch that transmits the PIN number needed to operated the gun. Absent the watch, a red light remains on the weapon to show that it is incapacitated. It is technology that could substantially reduce accidental shootings at home as well as cases where officers have their guns taken from them in shootings. I have long discussed this new technology is discussing the implications for product liability cases. There have been lawsuits against gun manufacturers for “Saturday Night specials” and other models under both product liability and nuisance claims. They have been uniformly unsuccessfully as falling short of the standards for proximate cause, defective designs, and other elements. However, we have discussed how new technology can change that equation by making alternative designs more affordable and convenient. We are still not there yet. The new gun will cost $1,399 and the watch retails for another $399. That is pretty pricey. Moreover, some will argue that they want guns to be exchangeable with others in a household or do not like the necessity of wearing a ring or watch. The question is what will happen when the technology gets smaller and more affordable. There is a chance that “dumb” guns will be viewed as defective. At one time, seat belts and air bags were viewed as extravagances. Personalized guns, or smart guns, can use RFID chips or other proximity devices as well as fingerprint recognition or magnetic rings. Magnetic ring guns are already available. There are even new designs that would allow biometric sensors in the grip and trigger known as (DGR) Dynamic Grip Recognition, which the New Jersey Institute of Technology says can distinguish an owner with 90% accuracy. Under the two basic tests for product defects such new designs can change the legal equation. Under the Second Restatement test of 402A, product design is defective is it is more dangerous than the expectations of the ordinary consumer. New technology can shape such expectations as smart guns become more prevalent. Under the Third Restatement, “a product is defective in design when the foreseeable risks of harm posed by the product could have been reduced or avoided by the adoption of a reasonable alternative design … and the omission of the alternative design renders the product not reasonably safe.” This could be claimed as such an alternative design if the costs come down and there is no real alteration in functionality. While the public safety benefits are obvious, the NRA has generally opposed these guns as having the potential for gun control options in future legislation. In all honesty, it could. While the Supreme Court has recognized that individuals have Second Amendment rights to bear arms, it did not rule out reasonable limitations. Mandatory safety designs would likely pass muster in some cases. Torts and technology have long had a unique relationship in the law. This is one technology that may be coming not only to a store but a courtroom near you. I never said it was a mainline weapon…live said its the tool of choice for assassins…. But the Israeli army does have it as standard rifle…. Your response was a bit confusing. I certainly don’t “know best”. I’m not sure if that was meant to be sarcastic or not. I was simply pointing out that nobody uses .22 as a line weapon. Armies have it in inventory as training weapons, or special tools (read: assasination, etc.). Not as a weapon to fight with. I don’t know if you just don’t personally draw a distinction between assassination and actual fighting. If you don’t, I understand your comments and arguments here. If you do, then you baffle me. In any case, talking with you is a frustrating proposition. I’ll leave you to your position, but I still contend that .22 is one step above replacing weapons with pellet guns. You know best…. AY: Name the question I have dodged and name the obviously incorrect statement I’ve stuck to. I have done so regarding you repeatedly. What happens once the government mandates these systems, and then manages to include an off switch? I have less of a problem with a firearm having a fingerprint identifier, but anything that uses RF is suspect. Even if every gun had a unique code, remember that TSA approved locks have unique keys and also master keys available to TSA. As the reason for the 2nd Amendment involves protection against government, letting the government have the means to control our opposition to them isn’t wise. Modern Technology here we go again! I am not impressed with the new smart gun and find it very difficult for this type of weapon to go viral. Great blog, great post, and as a security professional I will not use the smart gun ever. Maybe I am an old fashion gal.